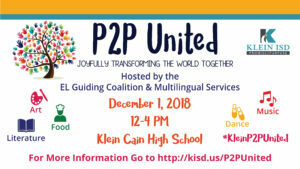 On Saturday, December 1, the EL Guiding Coalition and Multilingual Department are sponsoring the first ever P2P United Multicultural Event at Klein Cain High School. This event will be held from 12:00-4:00 and will be open to the Klein community. There will be student performances, food trucks, displays/booths and much more! We hope that you may already have projects in the works at your campuses that could be highlighted at this gathering, or that you would like to create/present something specifically for this event. For more information, go to kisd.us/p2punited. If you have any questions, please feel free to contact Brandy Madrid at bmadrid1@kleinisd.net. We look forward to seeing you at this exciting event!